Kyle McVey wins a header against Swifts' Paul McElroy. Pictures: Press Eye. Any Ballymena United supporters remember what they were doing on the equivalent weekend of the season last year? Allow me to jog your memory. It involved a trip to Dungannon Swifts in the fourth round of matches in the Danske Bank Premiership. Fast forward 12 months and by a strange quirk of the fixture list, Ballymena found themselves back at Stangmore Park on the penultimate weekend in August. Here endeth the similarities. 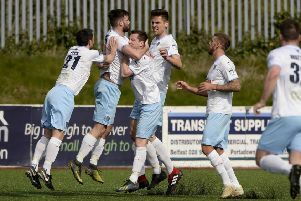 Last year Ballymena produced one of their most complete performances of the campaign to win 3-0 - a victory which took their points tally into double figures amid one of the most encouraging starts in the club’s recent history. Exactly a year later and Ballymena are still waiting to get into positive figures after a fourth straight defeat. It’s perhaps not common knowledge that a detailed history of Ballymena United is currently in the latter stages of production. Its author - long-time supporter and former club company secretary Neil Coleman - has doubtless unearthed many pearls of knowledge during his research that he didn’t previously know. It’s unlikely, however, that he would have given much thought to the season-on-season records prior to compiling the tome. So it was no doubt with equal measures of optimism and dread that Neil Tweeted during the week that defeat at Dungannon would represent Ballymena’s worst start to a league campaign for exactly 60 years. With any luck, Neil’s book will roll off the presses soon because the most up-to-date chapter in the club’s history is proving to be anything but pleasant reading for the Sky Blues. When the fixture list was unveiled, many Ballymena supporters, while they wouldn’t publicly admit it, would have been prepared to write off the opening two games against Linfield and Glenavon - two of last season’s top three - as the type of matches where any points gained could be considered a bonus. By game three, against Coleraine, United would have been expected to have opened their account, while the next two games, against Dungannon and Carrick, would have been expected to provide the launchpad for United’s campaign. That aspiration now lies in tatters after defeat at Stangmore Park, a result which now heaps pressure upon Ballymena ahead of Friday night’s visit of newly-promoted Carrick, now of course with Gary Haveron, a player revered by the Showgrounds faithful during his time at United, at the helm. You know things are bad when you attempt, as I did on my way home from Stangmore Park, to rationalise how ‘good’ or bad a particular defeat is. Certainly, Ballymena’s performance at Dungannon showed a marked improvement from the slapstick approach which has riddled the opening performances of this season. But you have to counter that by saying it came against one of the teams at a similar level to Ballymena in terms of Danske Bank Premiership status. If it’s sometimes hard to pinpoint the particular moment on which a particular match turned, this one might as well have come ringing a bell, such was its clarity. With the score still 0-0 in the second half, when David Cushley’s perfectly-weighted pass sent Allan Jenkins through on goal, you could almost visualise a flashing sign behind the goal bearing the message ‘the season starts here’. Instead, as the ball trundled agonisingly wide of keeper Andy Coleman’s post, you started to get that awful sense of foreboding that seems to be a feature of watching Ballymena these days. Even still, the game appeared to be meandering towards a scoreless draw which would at least have been a starting point for Ballymena’s season. Instead, they were undone by two neatly-taken goals and the long wait to get off the mark becomes at least a week longer. The key difference between having a bad run of form at the start of the season, as opposed to during the middle of it is that, a few months into the campaign you at least have the benefit of some points in the bag plus the knowledge and confidence that you have already showed you can pick up points in the league. When the bad run comes at the start of the season, it magnifies each defeat further and places even more pressure on the team. Who would have predicted that we would be talking about a Friday night home game against a newly-promoted side as being a must-win fixture? Ballymena desperately need to gain some sort of continuity and momentum over the next couple of weeks, which present yet more tricky obstacles in both league and cup.